This Spirit Island review was made after playing the game eight times. 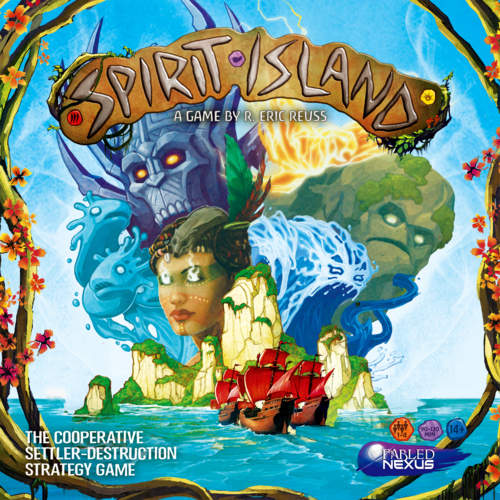 Spirit Island is a cooperative strategy game in which you control spirits who are attempting to prevent colonists from invading their land. The game was designed by R. Eric Reuss and is published by Greater Than Games. Throughout each game of Spirit Island, you’ll be trying to scare off and destroy invaders who are attempting to colonize your island. You’ll do this by using your spirit’s power cards and by getting some help from the Dahan, the natives who the spirits have allowed to stay on the island. Explorers – These are the weakest invaders. They do one point of damage and have one health. Towns – The second-strongest/weakest of the invaders, they do two damage and have two health. Cities – The strongest invaders, they do three damage and have three health. Presence – These are discs that represent the spirits. The more presence you have on the board, the more areas you can target on the island. Dahan – These are the natives who help the spirits fight off the invaders. Each Dahan can do two damage and have two health. All of the spirits play very differently. Some are great at attacking the invaders, some are great at causing fear, some work well with the Dahan, and others are better at defending the land. You’ll be working with the other spirits to keep the invaders under control until you’re able to build up your powers and wipe them off the island. Each spirit begins the game with a Spirit Panel and four unique power cards, and you’ll be adding more cards (Minor and Major Powers) to your deck throughout the game. The cards are either fast or slow; the speed tells you when the cards’ effects will be resolved (more on that below). The cards also have elements listed on them, which can be combined to execute your spirit’s Innate Powers (special abilities) and additional card effects if you get the right combinations. Spirit Phase – This is where you get to prepare for the current round. You’ll first choose one of your Growth options, which could be adding your presence to the board, gaining new cards, gaining energy (the currency in the game), or returning cards from the discard pile to your hand. You’ll then gain energy based on where you are on that track on your Spirit Panel. Finally, you’ll choose which cards you want to play and pay for them; the second track on your Spirit Panel tells you how many cards you can play. Fast Power Phase – Any of the “fast” cards you played during the Spirit Phase resolve now. Some spirits also have fast powers on their Spirit Panels, which also can be resolved during this phase if you have the right elements in play. Invader Phase – Invaders do damage to the land, build towns and cities, and more explorers show up. To determine which lands are affected, you’ll check which cards are in each space on the Invader Board. For example, if a Jungle card is in the Ravage space, the invaders (if there are any) will do damage in every jungle on the island. Any surviving Dahan can fight back against the invaders after they’ve attempted to do damage. Slow Power Phase – Slow cards and slow Innate abilities get resolved. Time Passes – This is the cleanup phase of the game where you discard cards and everyone heals up to full health. One of the ways that you can control the island is by causing fear. You’ll generate fear by destroying towns (one fear) and cities (two fear) and also by playing certain power cards. Once you’ve generated enough fear, you will earn fear cards, which get resolved at the beginning of the Invader Phase. 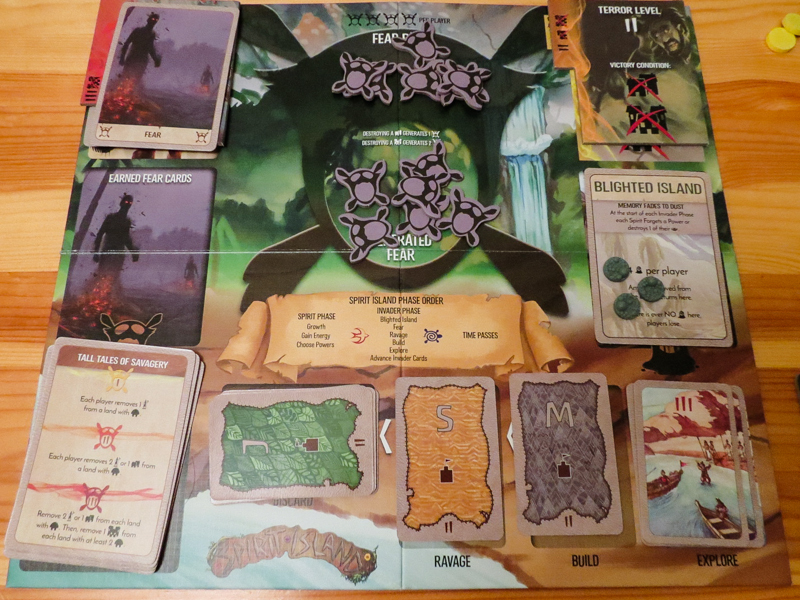 During most games, you’ll lose if too much blight is added to the land. Blight is added when the invaders do two or more damage to any part of the island. Blight also causes the spirits’ presence to be removed, which can also result in a loss if there a spirit has no presence left on the island. The third way to lose is if time runs out, which is when there are no invader cards left to be drawn. You’ll win the game if you meet the current victory conditions, which change as you generate fear. New Terror Levels will be revealed as you cause more fear, making the game easier to win. You can even cause so much fear that you win simply by scaring all of the invaders away! 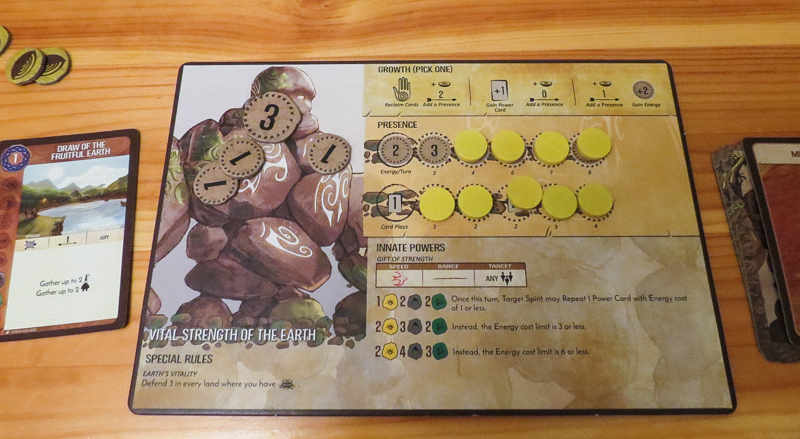 Those are the basic Spirit Island rules (well, some of them). 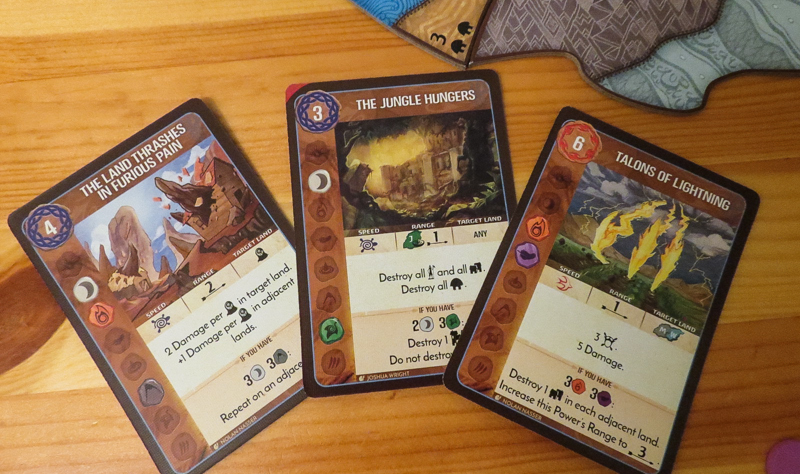 The game also comes with three Adversaries and three Scenarios, which add in additional rules and make the game more challenging. Spirit Island has a very nice look to it. 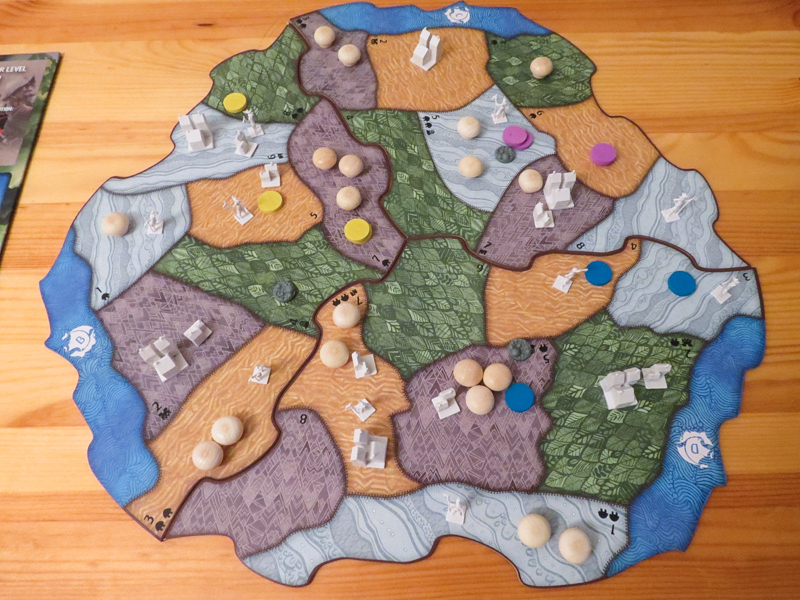 Even the mushroom-looking Dahan look great on the board, and I’m a big fan of those little explorers! If I did cooperation ratings, Spirit Island would probably get a 10 out of 10. Not only do you have to find a way to use your powers to help the team, you also need to figure out how to create devastating combos with other players. It’s awesome. Each of the eight spirits feels and plays so different than all of the others. You will have a completely different game plan than the other players, which helps to make you feel like an important part of the team. Alpha gamers will hate this game. You really can’t control what everyone’s doing since each spirit has its own cards and players will be gaining more unique powers throughout the game. That’s too much to keep track of, so quarterbacking shouldn’t be an issue. There is so much replay value in this box. The adversaries each have many difficulty levels, the scenarios add in rules variants, and the spirits themselves will change how the game plays. This game can hurt your brain just a little bit. Each turn you will be looking at the areas of importance on the island, trying to find cards that you can use that will prevent the invaders from causing blight, and talking to the other players about their plans. It’s a lot and it will definitely be too much for some people. It’s really odd that they chose to use two double-sided cards as player aids rather than putting all of that information on a single card. They made the larger cards for the adversaries, so I’m surprised they didn’t use that same card size for the player aids. Games can take a while, especially at higher player counts. I know this would have made the game more expensive, but little miniatures for each spirit would have been great. Spirit Island is definitely one of the best co-ops I’ve ever played, but it’s not that high up on my group’s combined list. I’ve played it with seven people and three said they weren’t fans because it’s too much of a brain-burner. It really is, but I’m personally a fan of games that require a lot of analysis since that usually means the game has massive replay value (which this does). Plus, as I explained to them, you get to know the spirits and cards over time and it becomes easier to figure out what you should do each turn. 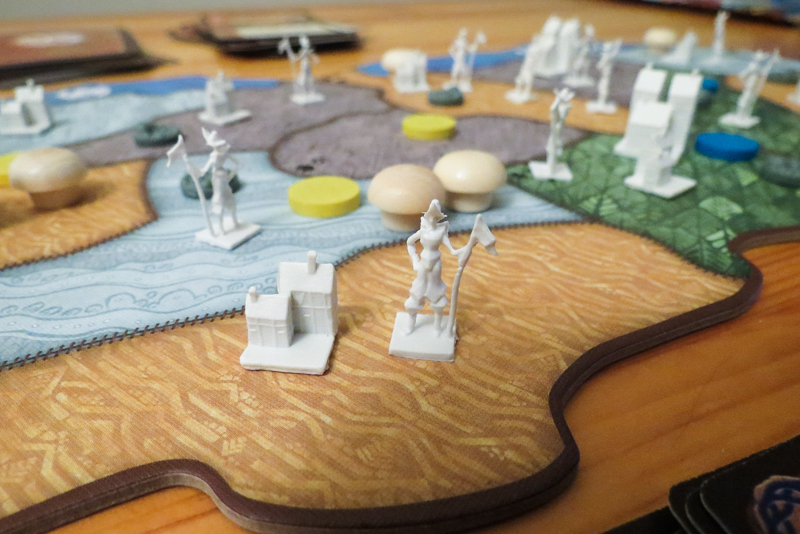 If you’re not a fan of deeper, thinky board games, you probably won’t enjoy Spirit Island. If this theme intrigues you and you enjoy highly tactical games that reward you for good planning, this is a must-try. Thanks for taking the time to read our Spirit Island review! To stay updated on all things cooperative board games, follow us on Twitter, Facebook, or via RSS.